This is what I aspire to be – a little old lady with a trash grabber, shopping bag and really colorful shoes. 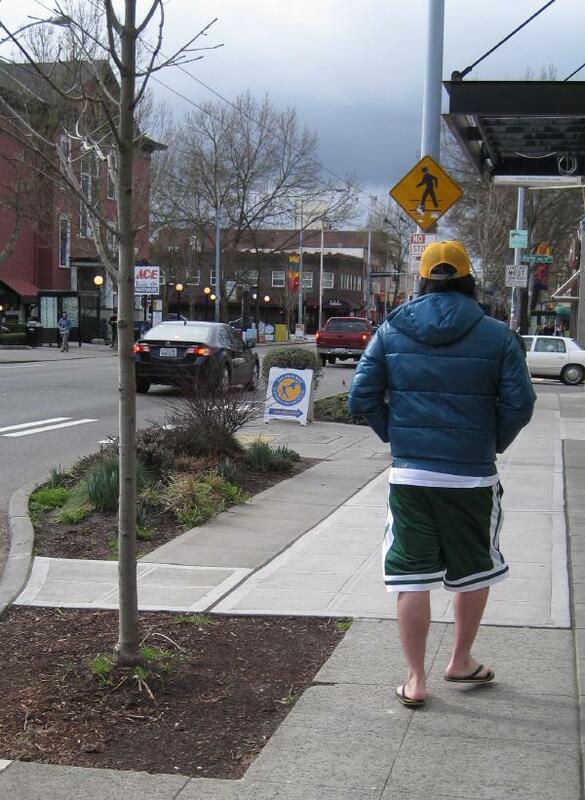 Great combination of winter coat, shorts and flip-flops. 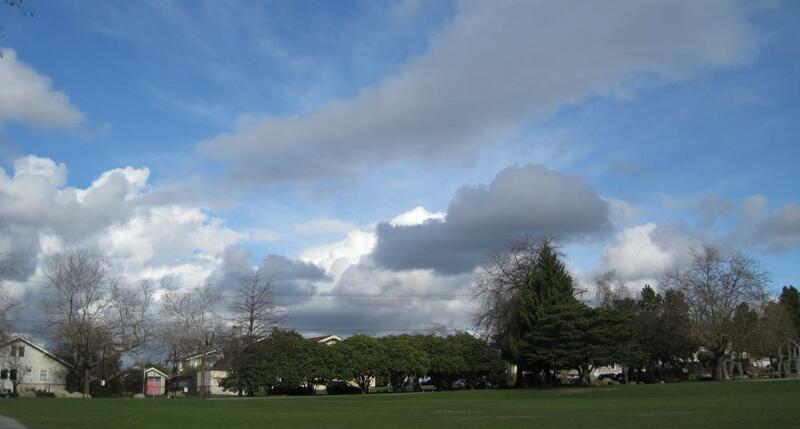 One of those sunny, breezy, cloudy, rainy, sleety days. Early spring. Helen, do you show these photos to the people you have photographed and ask their permission to publish them? Not always. If they’re looking directly into the camera and smiling then that means I’ve talked to them. But these can lack spontaneity. If they’re walking around the street “impromptu”, then probably not. I take a bunch of shots but I can never tell ahead of time which I’ll use and it’s hard to talk to and keep track of everybody. I never photograph kids without permission but I figure it’s fair game otherwise if you’re out on a public street. I try not to publish ones that are unflattering (or incriminating!). And to leave the faces out if I can. So we’re all fair game? Yikes. Just because you can, doesn’t mean you should. I don’t leave my home with any expectation that it is okay to photograph me and post my photo publicly. That would make me very uncomfortable and I cringe every time I see one of these photos here. Somehow, whether legal or not, and especially when it is not at a public event or in a crowd, it feels like another erosion of privacy. In an era of camera phones and ubiquitous commercial and law enforcement surveillance, I think we need to take extra care to respect our and our neighbor’s freedom just to go about our lives in our own neighborhoods without expecting to be photographed and, worse, put online with some (perdon) patronizing or lame caption. Helen-You can photograph me anytime! I feel nothing but affection for the people, and things, I photograph. I hope that comes across. walkinroun – these are editorial, with the exception of minors, Helen doesn’t need permission (a model release) no matter how lame you think her captions are. What seems fair is if I publish a photo of you personally which you would like removed, contact the blog and I will immediately do so. There is absolutely no intention to expose anyone to disparagement and ridicule – I am sure that myself and anyone else who writes for Wallyhood only wish to treat and be treated with kindness and respect. Okay, the lame comment was unkind. I stand by patronizing. It seems folks here feel pretty darn comfortable about having their photos taken and posted with “editorial” comments. But might this have something to do with photographers vs. photographees? : would you take a picture of a good friend and post it on a public site without (minimally) letting her or him know or (maximally) obtaining his or her permission? Or, how would you feel if you went to some public site and saw a photo of yourself (from behind? with a big behind!?) with a “cute” caption? And if you already published it, it’s a little too late. Yeah, that was me with the big behind a few montages ago! The shame! The shame! Oh for heaven’s sake. Your friends already know the size of your behind and the rest of us couldn’t care less. The real news in this series of photos is the wonderful and colorfully shod woman who seems to be actually doing something about the appearance of the sidewalks in downtown Wallyhood. Thank you yellow scarf woman! I’m pretty dismayed by QFC and it’s lack of attention to the appearance of it’s parking lots and sidewalks. I try to pick up as much as trash as I can as I walk around the neighborhood, but even with winter gloves it’s yucky. A trash-grabber is on my shopping list! I wonder where you buy them? I already have the shopping bag but the really colorful shoes will have to wait until I am brave enough. That woman was wonderful. I don’t consider Facebook a public website. And btw, NancyL, the behind stuff was intended to be jokey. My photo has not been posted and I do intend to duck and dodge Helen should I run into her and her camera. Maybe there are people who I do not want to know where I live… Maybe I want to maintain a very private life… Maybe I am homeless and wearing weird clothes and feel ashamed… Maybe I am old and don’t want to be called a “little old lady” with a “shopping bag” even if you think I am “wonderful”… Maybe I want to feel free in my neighborhood to wear crappy clothes to the store and not have me in them posted on a public site. Maybe I just want the courtesy of being asked, my feelings being considered and respected. Maybe I just think it violates ethical neighborcare to take photos of your neighbors and post them without their permission. Had Helen obtained the permission of the people she posted here, on what I do consider a public website, I would have no issues. But my original point was and is that I believe the “photographee’s” permission should be secured before posting if the photographer really wants to treat her subjects (and neighbors!) with respect, and that generally people in neighborhoods are – or should be – entitled to the courtesy of peaceful movement around their neighborhood without worrying that their photo could show up on a public website – without their knowledge or permission. This is where we live. This place is an extension of our home. I think it is fine that other people want to be photographed and posted here. Hooray for them. They will eagerly give permission as some have indicated on this thread. And I think it is nice that Helen considers her subjects with affection. That is beside the point to me. It just seems a little disingenuous to argue that it is all too hard to talk to and keep track of everyone she photographs. Take the time. It matters. This is an interesting discussion. Like others, I disagreed with walkinroud on first consideration. But then I started thinking further about the role of cameras in street life in 2011. I think the answer to the public-privacy question might hinge on whether Helen is continuing the the tradition of Henri Cartier-Bresson, or whether she’s essentially publishing facebook photos on a public website. It seems key to me that Cartier Bresson allows his images to speak for themselves. He does make judgments, and indeed he is involving himself in the formation of the picture, but the viewer can interpret the image however she likes. Cartier-Bresson’s judgments are almost intrinsically empathetic; if he wants to understand at all, he wants to understand the mind of his subject. Helen, on the other hand, takes a different approach. She attaches captions to her photographs. The viewer is not encouraged to read the photograph on its own merit; in fact, once the caption is read, forever will it affect the reader’s interpretation of that photograph. Moreover, Helen’s judgments stray far from the psychological or the sociological. She is interested in fashion, in conformity, in the history of street objects. She projects herself into the frame without the intrinsically empathetic approach of her predescessor. One also does not get a sense of dimension or geometry from her photos (which is ok – Cartier Bresson had a one in a billion talent that I don’t have either). I am pretty sure that we have laws in the United States that protect the right of photographers to make the kind of pictures that Helen is making, and to publish them as she is doing. I am glad that we have such protections, because they allow for the creation of important pieces of art and journalism. Unfortunately, Helen’s postings (in their current format) read more like facebook updates to me than art or even photojournalism. Given this, I think it’s not unreasonable to suggest that she has a moral responsibility (beyond that required of artists) to seek approval by her subjects prior to publishing her photographs. Yes, these posts are not intended to be works of art but simply moments of personal observation. But I don’t think artistic merit should be the measure for whether they should be published, rather the harm done to individuals. I sincerely believe them to be harmless but if there is indeed potential for unintentional hurt feelings then I do take seriously the need to address it, so am currently conferring with the editors of Wallyhood about appropriate future policy. I do appreciate your persistence in pointing this out, walkinroun! Thank you to both Helen and Brian for considering my comments seriously. Living in community is obviously a fine balancing act between freedoms and responsibilities. Brian correctly identified, with a far more elegant analysis, my much less articulate concerns about captioning our neighbors in ways I felt were patronizing. Helen correctly recognized my concern about harm from unintended consequences when subjects are not given an opportunity to “opt out”. I also hope readers consider the idea of our neighborhood as a special place where courtesy is extended, even to transient visitors. I recognize the rights of professional photographers and applaud the work of photojournalists. They also, if ethical, aspire to a professional code of ethics. I don’t want Helen to stop taking photos. I really like a lot of them and it is fun to see familiar stuff. I just would like her to extend the courtesy of asking permission before publishing when they involve individual human subjects aka our neighbors. My only comment is that Helen’s photo-postings of Wallingford are one of my favorite parts of Wallyhood, and I like their tone and content very much. I highly agree with walkinroun.. I decided to not say anything initially but I feel it’s unethical to photo others and publish their photos in a public forum without their permission. I donot care that it’s your photo ‘art’. I car ethat theire is an air of subterfuge and patronization towards the folks photoed. Just take the pix an dask permission. saying that you don’t know what you may o rmay not use is no excuse for not being ethical..
Walkinroun, again I am very sorry at how upset you are that some of the photos in these posts don’t have publishing permission. I’ve conferred with the amazing editors and writers of Wallyhood and we cannot come to a clear consensus on the right policy for this. We agree that we should make all reasonable effort to get permission; we also agree that in this country there is currently no requirement to do so. Beyond that, there isn’t a simple answer. In order for me to ensure that every photo in these posts has permission, I would have to change the nature of the way I take them, which is to go about my daily business trying to do too many errands in too short a time and taking quick shots of things I notice on the fly. It’s personal and idiosyncratic which makes it sometimes easy to catch up to and talk to people I see and sometimes not. Also, I often stockpile several weeks worth of shots and by the time I view them I can’t keep track of who I talked to and who I didn’t. It’s not ideal, but it’s the way it happens. It reflects the chaotic nature of the actual street scene. If I changed this method to be much more systematic and careful in order to ensure that no person ever appears without permission, it’s not clear that many posts will survive. I create them out of sheer love for the neighborhood but can’t spare too much extra time and effort out of my already too-full days without losing the simple effortless joy. I have, however, decided to make this change given the depth of the feeling out there. It is certainly not worth inadvertently hurting someone. If you have enjoyed these posts and will miss them, I urge you to get out and walk around observing all the lovely, vital and distinctive things in our neighborhood first-hand for yourselves. That perhaps is the best enjoyment of all. That sounds like a pretty good editorial policy to me, Helen. For the record, I don’t particularly care whether you obtain permissions prior to publishing your photos, but I do find reasonableness in the arguments of those on either side. Thanks to all for your contributions to our neighborhood. well, it sounds you have a plan and a policy for doing what you want and not regarding what others think. I also objected and you didnt address my thoughts. I find the pix of the older woman distasteful, disrespectful and out of line. I work in the schools. We are required to follow strictly what paents wish regarding photos of their hcildren. there is such a thing as privacy. kolokolo, I think you might have misunderstood. I HAVE made the decision to only include photos with permission in these posts from now on because of the feelings of readers like you. My statement was, if that means there are fewer posts, then that seems worth the trade-off. This was not the decision of the editors of Wallyhood, but my own. I hope this addresses your objections. If it makes folks feel any better, I myself walk down 45th St. almost every day looking like a homeless person, wearing shabby clothes, carrying a big backpack and large shopping bags stuffed with groceries and library books, picking up trash and sometimes even pushing a cart that I’ve found and want to return to the store, and I’m not the least bit ashamed. Should I be? The woman in the photo truly IS my role model. I think she’s beautiful. I can only hope to be as confident in my priorities as to care more about being of service to others and pleasing myself than what other people think of my appearance. I get closer but am still trying. She didn’t strike me as the kind of person who would have been the least bit ashamed of the way she looked in that photo. I’m sure you post these photos of endearingly colorful Wallingford residents with the best of intentions. Readers seem to enjoy them, and I’m sure it’s perfectly ethical and legal. Still, I can see how posts like this one might come off as patronizing or objectifying. Or even a little cheesy. My advice would be to skip the captions and let the photographs speak for themselves. Helen, until your most recent post it was not clear to me that you had decided not to publish people pictures without permission. Please accept my sincere thanks. I, for one, will truly be able to enjoy your photos much more knowing that the “photographee” is “in on it”. I bet the extra effort this will take will pay off in dividends with the insights and conversations you will enjoy with the people you photo. Grazie! Oh, I’m glad I got the chance to clarify! I probably said it in too roundabout a way, trying to explain what would have to change in order to accommodate this. There will be fewer posts and they will be different in nature. But I have decided it’s worth it. This is the key point: “But if it’s that important, then I’ve decided so be it. It is certainly not worth inadvertently hurting someone.” I’ve edited the comment a bit to make it clearer. Floor Pie, I must have a naturally cheesy sensibility. 🙂 Not to everyone’s taste, but I never thought it was offensive. “Lame” might be the worse description. Honestly, I think the photos without captions would be dull. They aren’t compelling enough to stand on their own. But thanks for the input! Have to add one final caveat. In any situation in which people appear in the background of photos which I take, for either my photo posts or for general Wallyhood news articles, who are chance bystanders and aren’t being singled out and commented on, I still can NOT guarantee that they have been asked for permission if such permission is unreasonably difficult to obtain. An example would be a general scene of a group of people at the Farmers Market, Tilth Harvest Fair and the like. Such a high standard would unnecessarily eliminate many photos from being published without good likelihood of giving offense.